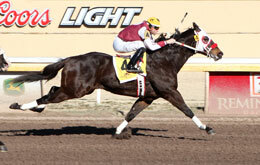 Jb James, under jockey Russel Hadley, winning the Mighty Deck Three Handicap at Remington Park on Sunday. OKLAHOMA CITY, OK�MARCH 9, 2014�Timing is everything and for JB James, his winning final time of :12.881 seconds in the $77,000 Mighty Deck Three Stakes was nearly a fast enough timing to break the track record of 12.849 for 250 yards. The race distance was also key in the timing, as the fleet 4-year-old capitalized on the race�s position in the Remington Park stakes schedule to defeat Feature Hero by three-quarters of a length. The latter, won the $2.8-million All American Derby in 2013, the richest race in the history of American Quarter Horse racing. Feature Hero is expected to improve as his stakes attempts get longer this season. Bred in Oklahoma by Jon York, the IVORY JAMES gelding earned $45,930 for his owner Bella Vista Farms of Arcola, Ill., he is out of the Dean Miracle mare Deans Dusty Bunny. JB James is trained by Eddie Lee Willis and was ridden to victory by Russel Hadley. JB James paid $10.40 to win $3.80 to place and $2.40 to show. Feature Hero was the heavy 4-5 wagering favorite and paid $3 to place and $2.20 to show, while Champion Huddle checked in third to pay $3 to show. JB James has now won five of seven career starts with four of the wins at Remington Park. His career earnings now stand at $101,261. Feature Hero races for Reliance Ranches, LLC and is trained by Eddie D. Willis. Jimmy D. Brooks was aboard to pickup $15,310. Champion Huddle finished three-quarters back in the show position. John Hammes conditions the 3-year-old for owner Terry Freeman. Debbie Freeman is the jockey and breeder. He picked up $8,420 for the effort. Completing the field were Eyesa Romantic, Big Boi, Ernies Palace, Jess Faith In Candy, Redneck Sis, Grc Royal Azoom and Bps Jumpin Frisco. The Mighty Deck Three is for Oklahoma-breds and is named in honor of the Oklahoma-bred who won the 1980 Rainbow Futurity and was later named the AQHA Champion 2-year-old.